Photographer's Broadside. Circa 1890's. 5 x 8 inches. A.. 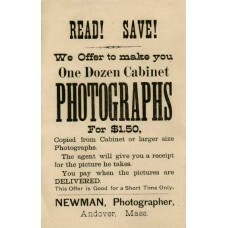 Photographer's Ad. W.H. Hoedt. Philadelphia. Real photo postcard. 3 1/4 x 5 1/4 inch sil..